TSPSC Recruitment are 1,011 posts which are filled through Teacher Recruitment test TRT. Qualified candidates have to apply for these TSPSC LP Jobs using the official web link of telangana state www.tspsc.gov.in. TSPSC Teacher Recruitment Test applications starts from 30th October-2017. Last date for TSPSC online applications is 30-11-2017. 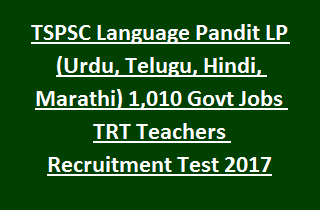 Selection of applicants for TSPSC Language Pandit Recruitment is based on APTET/ TSTET/ CTET tests. Final Selection of candidates is based on scores obtained in Teachers Eligibility test held by Telangana Govt. TSPSC TRT will be held in the month of February 2018. Salary for LP vacancies in TSPSC Recruitment is Rs. 21,230/- to Rs. 63,010/-. Online processing fee for general candidates is Rs. 200/- and Examination fee is Rs. 80/-. No examination fee for others. Please check the information regarding Application procedure, Examination Fee, Selection Procedure, Educational Qualifications, Age details, Teacher Recruitment Test dates of Telangana TSPSC Language Pandit (Urdu, Telugu, Hindi, Marathi) TRT Teachers Recruitment Test Notification are mentioned below. TSPSC has released total LP Vacancies in School Education Department are 1,011 posts. Post Name: Language Pandit: 1,011 posts. 1. Language Pandit (Excluding Urdu): 985 posts. 2. Language Pandit(Urdu): 26 posts. For district wise vacancies of TSPSC Language Pandit (Hindi, Urdu, Marathi) see the notification. Graduation with Telugu/ Hindi/ Marathi/ Urdu as one of the optional subject/ Graduation in Literature in Telugu/ Hindi/ Marathi/ Urdu or Post Graduation Degree in concerned subject. See the TSPSC notification for more details. Age relaxations applicable as per Telangana Govt rules. Pay scale for TSPSC LP Vacancies is Rs. 21,230/- to Rs. 63,010/-. Candidates will be shortlisted based on the score obtained in written examination. Teacher Recruitment Test will be held for 80 marks and consists of 160 questions. Duration of exam is 2 hrs 30 minutes. -General Knowledge &Current Affairs: 20 questions- 10 marks. -Perspectives in Education: 20 questions- 10 marks. -Teaching Methodology: 32 questions- 16 marks. Final Selection of candidates is based on marks secured in written examination (80%) and TET Exam (Andhra Pradesh Teacher Eligibility Test APTET/ TSTET Telangana Teacher Eligibility Test/ CTET Central Teacher Eligibility Test) (20%). Examination will be held in 2nd week of February-2018. Online processing fee is Rs. 200/- and Examination fee is Rs. 80/-. Examination fee is exempted for BC, SC, ST category candidates of Telangana and PH, Ex serviceman. Applicants have to read the user instructions for application submission. Open the TSPSC official website http://tspsc.gov.in. Fill the application as per the guidelines. Online application submission starts from 30-10-2017 to 30-11-2017.